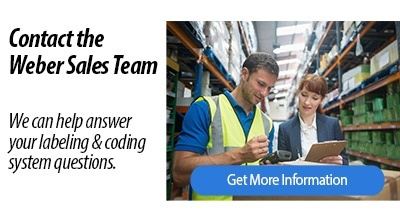 We can help solve your labeling problems and answer your questions fast. Weber has a nationwide network of direct account representatives who are trained to identify labeling problems and provide you with the most efficient ways of solving them. Your local representative will give you the personal attention you need in choosing the right labels or a labeling system and stand by you through installation and training. Weber's account representatives are label experts who can help you choose the right materials and design for your label project, then make sure you get the pricing that fits your budget. Call us at 1.800.843.4242 to talk to your local Weber Account Manager.